According to a "trusted US publishing source," Epic's Gears of War 3 will be revealed this year at E3, and will hit shelves in April of 2011. When Epic president Dr. Mike Capps said that fans of the company could look forward to something "exciting" at E3, most people immediately assumed he was hinting at a reveal of the next Gears of War. According to Edge Online, if a "trusted US publishing source" is to be believed, then those people were right on the money. Edge's source claims that fans ready to hop back into the shoes of Marcus and Dom will get to do so next April with the release of the as-of-yet-unannounced Gears of War 3. The title will be formally and fully unveiled at E3 in June (confirming Capps' statement), but a teaser trailer will be released next month on April 8 - almost exactly a year before the game is allegedly scheduled to come out. 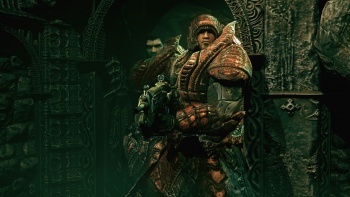 Gears 3 will continue the story of humanity's fight for survival against the Locust Horde, and now that they've finally gotten that subplot with Dom's wife out of the way there should be nothing standing in between the COGS and brutal chainsaw-gun-to-the-face justice. What sayest thou, people? Are we excited for a new Gears or what? Update: Epic's Mark Rein, to VG247, when asked about this: "You're kidding, right?" To be honest, that could mean anything. It could mean "No, you're crazy, we're not making Gears 3." It could mean "No, you're crazy, do you think we'd release a title like Gears 3 any time that wasn't November or October?" It could just be trying to throw people off the trail.